Adaptive Intelligence is the ultimate platform technology are you using it effectively? It cannot have escaped your notice that all of these incredibly successful companies also sit on another platform, the internet which in turn relies on physical platforms including optical cable networks and the electricity grid. Stretching the metaphor even further, all of this requires other, more intangible, platforms such the existence and imposition of law, binding contracts, authentic negotiation and of course the universally accepted concept of money as a means of exchanging value. TRUST underpins these platforms and allows us to make more or less reliable decisions. But is trust the most fundamental platform of all? No, trust can be viewed as the final gateway to making decisions. For example, we trust when we decide to use Google as our preferred search engine, Facebook as our default social media platform or Amazon to buy things. But what even more fundamental platforms does trust rely upon? What allows individuals and groups to invest trust in other people and organisations? Trust that is required and sufficient for us to make wise decisions and take considered actions with a greater likelihood of success? The benefit of controlling our decisions at this fundamental level can turn wicked challenges into profound opportunities. For the moment please allow me the latitude to skirt around the thorny issue of whether God is the ultimate, ultimate platform for everything we do, Instead let me concentrate on another fundamental “platform” over which we all have influence; something we can learn, something we can leverage to make those wiser decisions more often. I mean of course to our innate intelligence. I’m not simply referring to our IQ, for as so many studies have shown IQ alone is simply not the stuff upon which greatness stands. I am referring to a much more universal form of intelligence. It is the reason the human race is, at least for the foreseeable future, the dominant species on the planet. This is what I call our Adaptive Intelligence or AQ. Our ultimate platform technology is our Adaptive Intelligence (AQ). Humans are a successful species because we seem to be able to adapt to pretty much any environment, and we adapt to persistent changes in those environments. Unlike other animals we can make prodigious alterations to our behaviours as well as our physical environment, and the outer edges of what is possible are still to be discovered. The challenges we face and the opportunities we reveal today, are ones we create for ourselves. The selection pressures we experience are those imposed by our mad social, business and political world and are expressed in terms of our interactions with other people and groups. We use our Adaptive Intelligence (AQ) every time we engage our Emotional Intelligence (EQ), Intellectual Intelligence (IQ) and our motivational or Positive Intelligence (PQ) in response to a new situation. If we can apply the right amount and quality of EQ, IQ and PQ to any given situation we optimise our AQ to drive our most appropriate response to change; we “dance in the moment”, mindful and focussed on the world in front of us. This is emergent wisdom at work. Modern scientific research is catching up with what traditional practices have known for a very long time that wisdom stems from the interaction of the ways we express our EQ (clear purpose, important relationships and deep emotional connection [expressed as love, compassion & empathy]), IQ (creativity and analysis [expressed as planning & innovation]) and PQ, (self-worth, identity, courage – [expressed as motivation, focus, action). 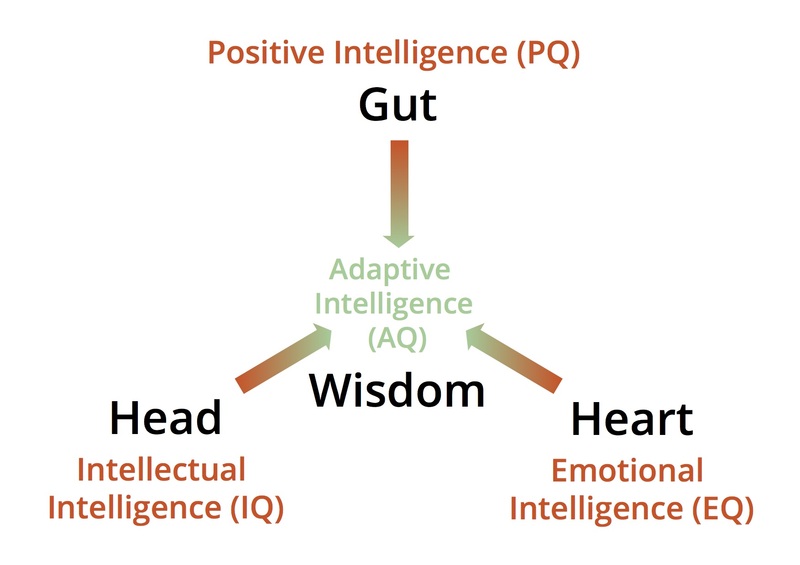 Engaging our intelligences in the order Heart, Head, Gut makes sense because in any endeavour if we have purpose (EQ), we think innovatively (IQ), we are more likely to bring this novelty into the world with confidence (PQ). When working in full harness this Multiple Brain Pathway functions to create emergent wisdom; what we often call intuition. Businesses employing this process are much less likely to suffer the ignominy suffered recently by Volkswagen, Mitsubishi and others where their behaviour were misaligned with their claimed core values. If optimising AQ enables individual people to excel, how can organisations structure themselves to capitalise on their corporate AQ to make wiser decisions a little more often, and certainly more often than their competition. A closer look at the definition reveals some interesting themes behind the words. Dynamic = Persistent change of state. Co-evolving = Implies more than one party contributing to adaptive change. Communities = Groups of more than two stakeholders working in shared action. Diverse = One type of community member cannot ensure fitness to the environment. New Value = Delivery of a value to someone else for the first time. Collaboration = Belief in a common win when capabilities are synergised. Competition = The energy needed to drive the process in adversity. There is a mixture of heart (EQ), head (IQ) and gut (PQ) capacities here, as well as the principles of time and change. Collaborating co-creative ecosystems will become the most successful 21st Century business model; a “Business Platform Technology” if you will. Business ecosystems appear then to be driven mostly by “EQ” concepts ensuring that its purpose is completely clear to all collaborators, customers and stakeholders and lies at the core of everything they do. If this is the new business “normal” we should look at how the most successful organisations and ecosystems will be operating. Just in case you think that this concept is esoteric and academic, in 2014 the Alibaba Group during its world record IPO, used the term “ecosystem” one-hundred and sixty times in its prospectus! I posit they would not waste their time or anyone else’s if they were not serious about this concept, and its importance to their business’s future success. A series of permeable membranes lie between our individual inner world, the internal culture of an organisation and all those external collaborators, customers, competitors, regulators, legislators, politicians etc., who lie outside. An even bigger challenge is that the barriers between business sectors, businesses and customers, and all the other players are dynamic, forever changing and often blurring. Think how the “Uber” business principle has disrupted so many traditional business sectors and will continue to do so for the foreseeable future. The most successful disrupters will design and deploy novels ways to behave and operate in the rapidly evolving highly connected global business ecosystem. This will ensure alignment of personal and organisational behaviours to boost financial performance, and engender greater societal and environmental impacts. The successful companies of the next decade will be those who wholeheartedly embrace the ecosystem concept. This will include platform providers like Oracle and their collaborators who really get it! "ISVs [independent software providers] are a critical component of Oracle’s business ecosystem. 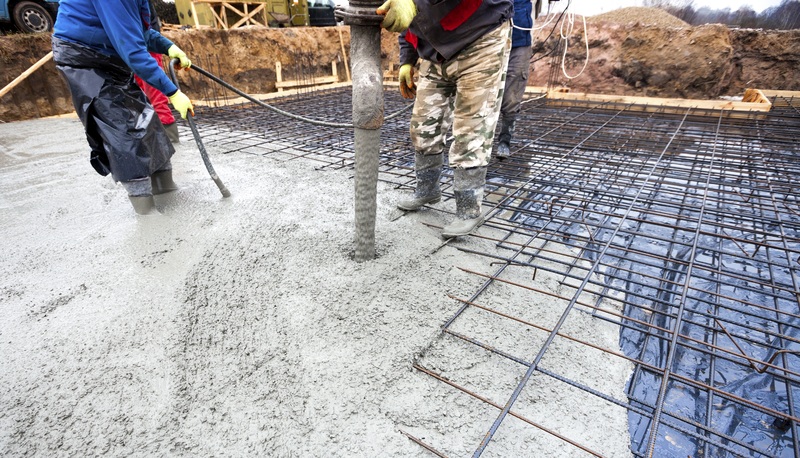 By partnering with Oracle they can enjoy the benefit of learning the latest technologies and best practices, while lowering development costs." The principles of Adaptive Intelligence are founded on increasingly compelling evidence. Leaders who learn to leverage their personal AQ more effectively will undoubtedly experience greater personal success. This will encourage them to identify elements within their organisation where the corporate heart, head and gut lie and strengthen them. From that springboard the organisation will create an environment that fully leverages corporate AQ to align with the challenges and opportunities they encounter. Adaptive Intelligence Consulting Limited, in collaboration with twelve other companies, provide executive teams with access to an AQ-driven, integrated process of evidence-based and benchmarked measurement of the strengths and weaknesses of business culture, and deliver potent validated interventions designed to mitigate specific blind spots. What follows are enhanced bottom-line results as well as improved greater societal impact and the enhanced brand value that ensues. Dr Gary Coulton is CEO of Adaptive Intelligence Consulting Limited, Associate Consultant with Denison Europe and a consultant with KeyHubs.